The answer to this question is not as simple as it may seem at first. Indeed this question is a good illustration that the “school” solution is often very different to what is happening in real life. Many websites reported yesterday that the night between December 21st and 22nd would be not only the longest night of the year but also the longest night in Earth’s history. The arguments they used to come to this conclusion were quite reasonable. Since the tides caused by the Moon’s gravitation slow the Earth’s rotation each next year the longest night will be longer. Using this logiс, the website concluded that the passed night was the longest ever. Nevertheless, the tide effect is not the only effect that changes Earth rotation speed. There are others. Do you remember how a figure skater slows his rotation when he moves his arms apart? Redistribution of Earth’s mass changes its rotation speed in a similar way. This effect could be bigger that the tide effect in shorter term. That is what we observe right now, Earth rotation speeds up last decades. 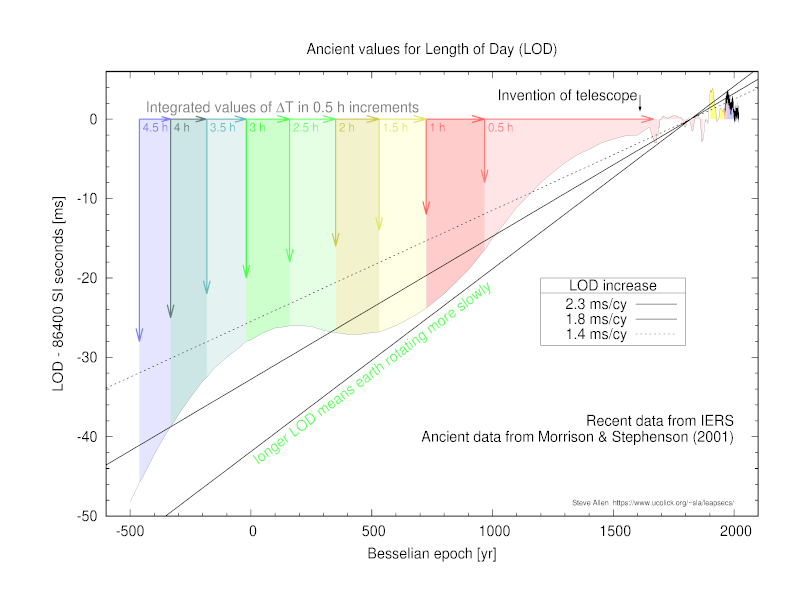 This data indicates that the last night was not the longest in Earth’s history. According to the data, the longest night was one in 1912. What could be a reason for Earth’s mass redistrbution? One of such reason could be global warming and melting of ice caps at the poles, which leads to redistribution of the Earth’s mass from the poles to the Equator. This effect is similar to moving hands apart by a figure skater. However, it will slow down Earth rotation while we observe rotation speeding up. You cannot claim global warming here. There are other huge mass movements like continental drift that moves huge masses from the Equator to the poles. I do not know what is particular responsible here. But we can conclude based on the observations that there must be some mass redistributions that speeds up Earth rotation despite other effects like global warming and tides slow it down. This is a good lesson for us showing that real life is often much more complicated than simple models.